How is Gold Bullion made? Before we get to the physical gold bullion we buy and sell here at SD Bullion, ask yourself the following first: How is gold made? The origin of gold bullion (according to recent scientific discoveries) begins with violent colliding twin neutron stars or in various single star supernovae. In these rare yet most violent events of the universe, heavy precious metals are formed and eventually traverse across space on asteroids until ultimately forming into and or colliding with planets. Gold laced asteroids infused the Earth's mantel and crust with various precious metals like gold. Gold ore bodies today tend to be found on and in Earth's crust, in rocks often mixed with silver deposits. Many of the very first gold coins circulated in modern day Turkey. 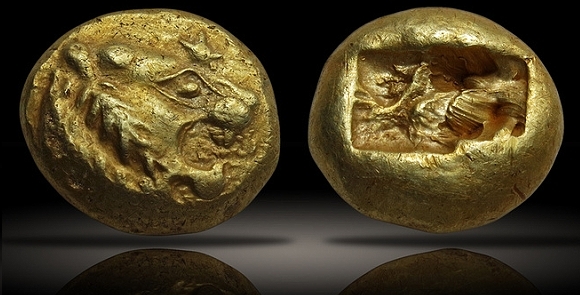 These ancient 6th Century BCE precious metal coins were a naturally occurring mix of mostly gold and a minority percentage of silver called electrum. Today, gold mining occurs across the world, yet most of the easiest gold finds for human beings have already been made. When people think about mining gold, they often picture drilling in open gold mine pits (60 - 70% of gold mines today) or even gold mining miles underground (30 - 40% of gold mines today). But merely mining gold ore is just one stage in a long complex process often resulting in either physical gold bullion coins, bars, or gold jewelry. Well before most gold gets extracted from the Earth, professional mining exploration and development needs to take place. Gold prospectors try to locate and then determine the size of a potential gold deposit including how to extract and process the gold ore efficiently, responsibly, and safely. It generally takes from 10 to 20 years before a gold mine is prospected, permitted, and finally ready to produce gold ore deposits which are eventually refined into fine physical gold. Total new annual gold supply currently reaches around 100 million troy ounces per year ( 1 tonne of gold = 32,150.7 troy ounces of gold ). Every year about 40 million troy ounces of gold are generally reabsorbed from old global gold scrap recovery efforts. Thus about 70% of annual gold is fresh from the ground, about 30% comes from physical gold recycling. Conservative estimates are that we humans have mined approximately 187,200 tonnes or just over 6 billion troy ounces of gold all time. Government central banks likely hold 1 of every 5 ounces of gold mined all time currently within their vaults (e.g. Russia, Germany, China, etc.). The mid ninety percentile of gold we humans have ever mined is likely still with us today. Small unrecoverable amounts of gold have been used up in either cutting edge industrial applications or through lost artworks, jewerly, and bullion items. In this 21st Century Gold Rush, China has simultaneously become both the world's largest gold miner and the globe's biggest gold consuming nation. In fact, the Chinese government has been actively buying gold mining rights and gold bullion reserves around the world while she exports none of the gold she mines internally. Chinese state propaganda also clearly encourages Chinese citizens to hoard gold as well (see section #3). How does gold go from imploding stars to your personal gold bullion reserves?